The year is 1969. While the Woodstock music festival rocks the world Apollo 11 lands on the surface of the Moon. The Beatles perform together live for the last time, 250,000 people march on Washington D.C. to protest the Vietnam War and Austrian born Mr. Universe winner dons the name Arnold “Strong” for his big film debut in “Hercules in New York“. Oh boy, the swinging ‘60s is upon us. Set your seats in their upright and locked position. The Action Movie Time Machine is set to our target destination. You did remember to ware your bell-bottoms and Led Zeppelin t-shirts right?…RIGHT?! “Hercules in New York” begins high atop Mt. Olympus with the Greek Gods who are gathered around Zeus as Hercules, Arnold Strong aka Arnold Schwarzenegger, is pleading his case, that he should be allowed to visit Earth. Hercules has grown bored with the godly lifestyle and wants to explore the lives and times of us mortals. This angers Zeus, who thinks that Hercules’s place is among the other gods. For his insolence, Zeus decides to punish Hercules by…sending him to Earth…to interact with the mortals…Does this makes sense anyone else? With a fiery thunderbolt, Hercules disappears from Olympus and falls to Earth, past a Pan American flight and into the Atlantic Ocean. Here Hercules is picked up by a shipping freighter where there is some confusion over who he is -- not understanding that he is the real Hercules -- and how he wound up so far off shore. Soon the ship docs in, none other than, New York City and Hercules decides to leave the ship and stretch his legs which for some reason turns into a brawl among Hercules and the ship hands/doc workers. This is one of many scenes that illustrates the “fish out of water” story that is “Hercules in New York”. Prepare yourself for hijinx. 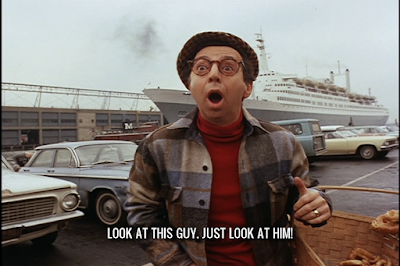 As Hercules escapes the brawl, he meets an interesting individual who goes by the name Pretzie, Arnold Stang. Pretzie makes a living by selling pretzels to the doc workers during lunch, and now, he acts as Hercules’s tour guide. The odd couple travel all over the city and misunderstandings are abundant. Herc and Pretzie have no money to pay for a cab ride -- a fight breaks out between Herc and the cab driver which results in Herc turning the cab over onto it’s roof. But, that’s not before Herc says one of the more memorable lines of the film; “Bucks? Doe? What is all this zoological talk about male and female animals?”. Of course this is in reference to money. Later, while showing up a track and field team, he meets Helen, Deborah Loomis, and the two hit it off. While on their date, Helen treats Herc to a carriage ride through Central Park. 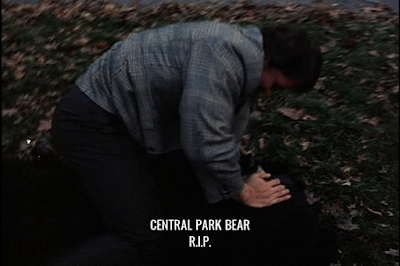 There in the park, Herc and his date encounter a “600 pound grizzly bear…known to be surly and dangerous” that recently escaped from the zoo. 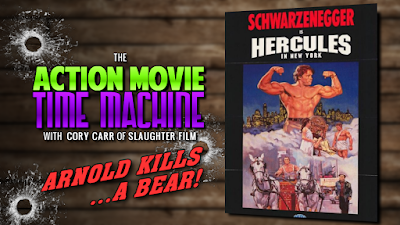 Herc protects Helen and defends the honor of young woman by battling the bear in hand to hand combat…TO THE DEATH! Some say it’s a bear, but I say it’s a man in a cheap bear suit --Classic. Most of this is just goofy fun, showcasing Herc’s strength and Arnolds “Strong”’s grasp of the English language. But now we approach the meat of the film. Pretzie and Herc decide to use his strength to make a little bit of money by entering him into wrestling matches and soon his victories attract the attention of some mobster types -- who are named Maxie, Fat-Lips and Nitro, just for the record. The mobsters “lean” on Pretzie, forcing him to sign Herc into a contract working for the them. This is all fine and well, for a while, until the mobsters set up and promote a weight lifting challenge pitting Hercules the Great against Monstro the Magnificent. Before this takes place, there is a doin’s transpirin’ up on Olympus. Juno is scheming to deal Hercules a humiliating blow, forever disgracing him in the eyes of his father Zeus. Her plan is to slip a magical powder into Hercules’s drink -- causing him to temporarily lose his godly strength and causing him to lose the competition. Who the hell is Juno you ask? Well, Juno is the Roman counterpart to Hera of Greek mythology from which Hercules and Zeus come from. 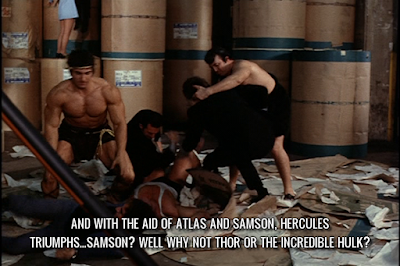 There is a lot of Roman names used for Greek gods in this film. It seems like someone didn’t do their homework. In fact, the man who wrote this film, Aubrey Wisberg, never went on to write, direct or produce anything else. This was the end of his career. Let that be a lesson to you all, just how important it is to know your gods. So Hera’s plan, I mean, Juno’s plan works without a hitch and Hercules loses the weightlifting challenge. Herc’s mob promoters aren’t to happy with him -- they put a lot of money on Herc to win and they feel they’ve been cheated. Herc and Pretzie make a break for it, which begins a lengthy chase through Central Park, Time Square and finally ends inside a printing factory where Herc and Pretzie are cornered. Without his godly strength, Herc is a sitting duck. High above, Zeus looks down at Hercules and declares that no son of his shall be taken out by any group of mortal ruffians. He, with the help of Mercury and Venus, calls for the aid of Atlas and Samson to help his beloved son and together the strongmen are able to fight off the mob. With Hercules safely back on Mt. Olympus, the film ends with Zeus paying New York a visit of his own. 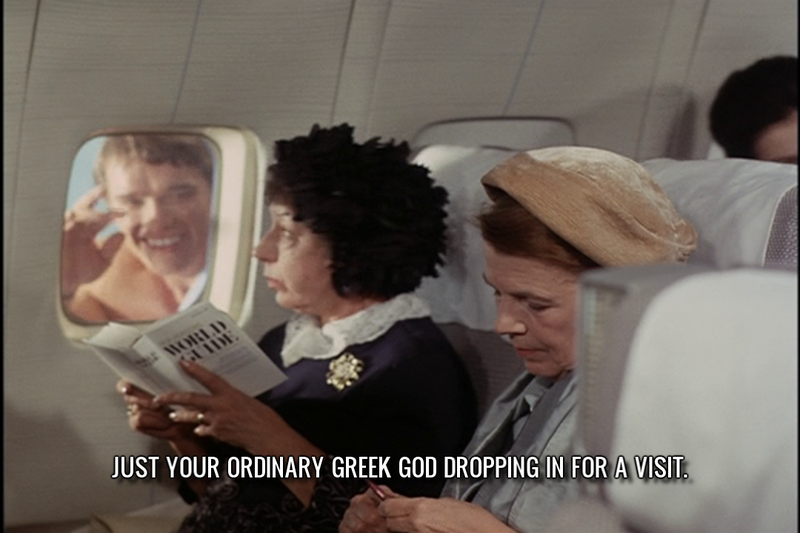 And if the tales of Zeus are any indication of what he’ll be doing on Earth, there will be many fatherless demi-gods being born in the year 1970. Boy, this movie sure is something. 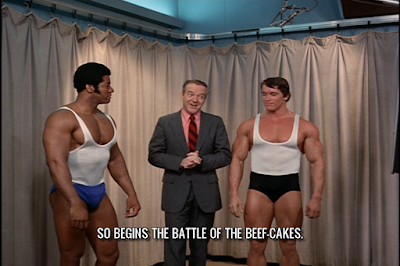 I’m sure you can tell that this isn’t your typical Arnold film. This was Arnold’s first film and you can tell by his mediocre acting and speech. But that’s what gives the film it’s charm. Arnold is billed as “Arnold Strong” because the filmmaker thought an American audience wouldn’t be able to pronounce Schwarzenegger. In some cases this is still true today. I don’t know if “Hercules in New York” ever got the MST3K treatment, but it sure deserves it. Arnolds speech was so poor that, after it was filmed, his dialogue was dubbed over. For many years this was the only version available in theaters or on VHS. Only recently -- with Arnolds popularity being what it is -- did the film get a DVD release restoring his original dialogue. This is the version that is a MUST SEE. 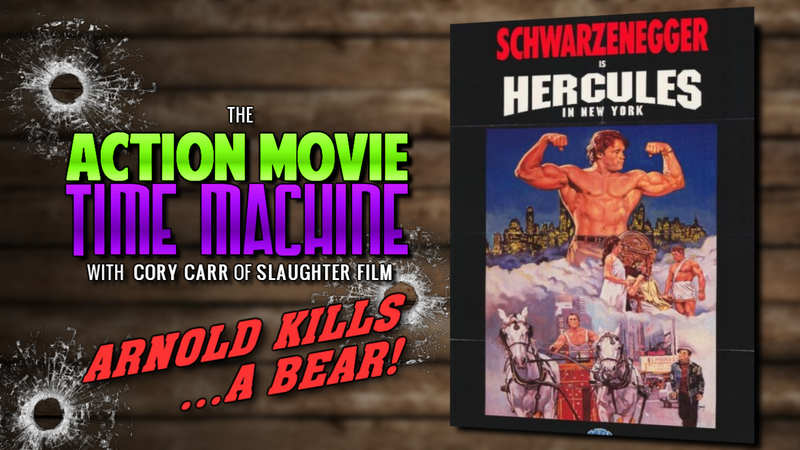 Arnold isn’t the only thing that makes this stinker into a cult classic. 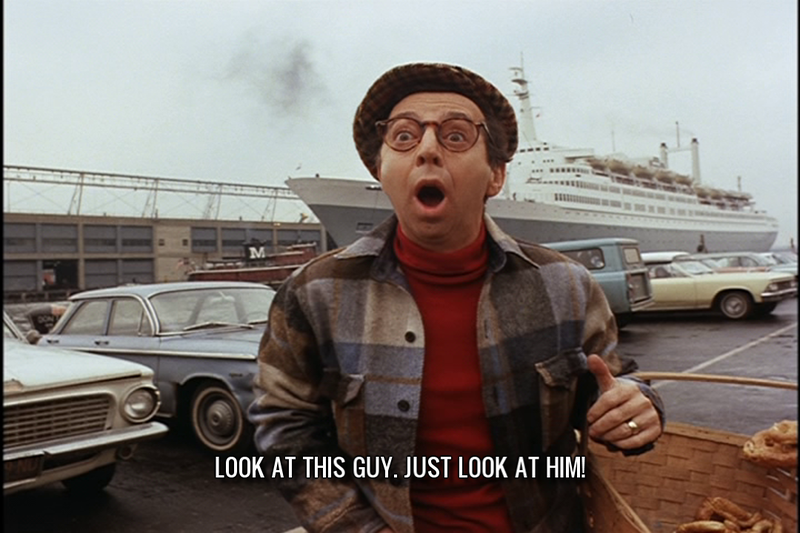 The acting is mediocre overall with the exceptions of Arnold Stang and James Karen, who plays Helen’s father. These two play their rolls very well, and Stang’s totally animated faces are the best. 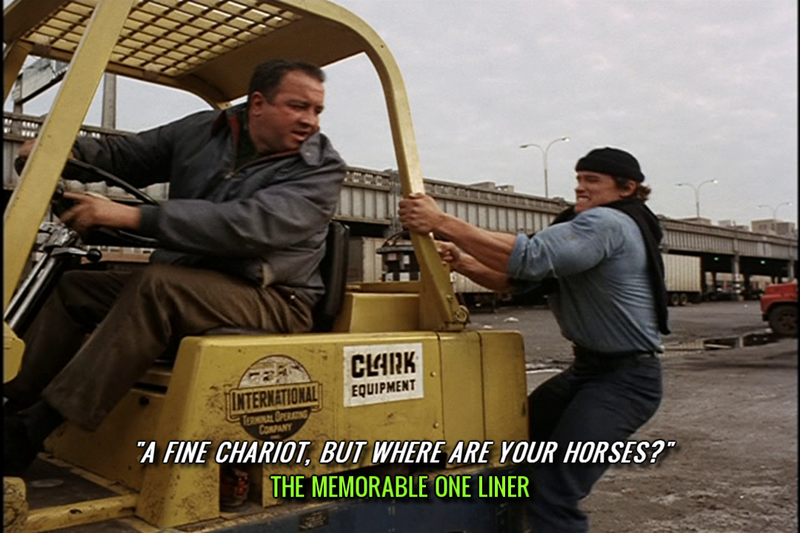 So in conclusion, “Hercules in New York” is amazing for all the wrong reasons and I highly recommend it. The film deserves a .5 bullet rating, but due to it’s shier amount of ridiculous entertainment I bump that rating up to a full 5 bullets. 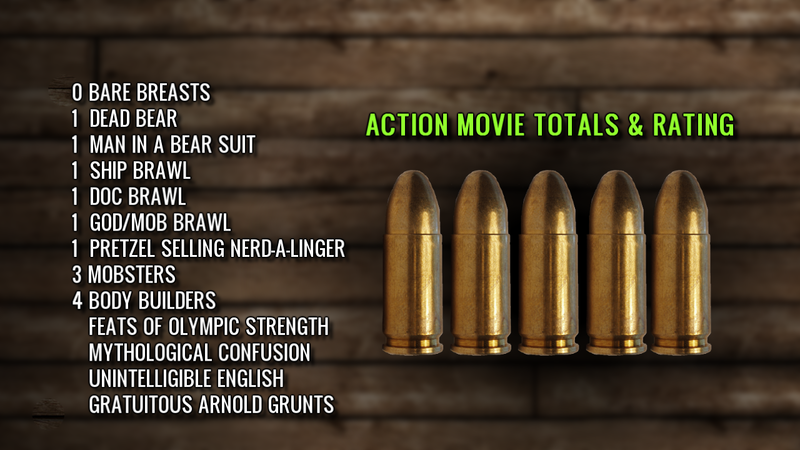 This has been a fun look at a wide variety of Arnold Schwarzenegger films. 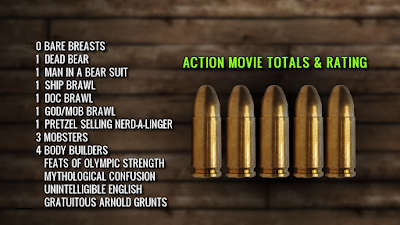 Arnold is probably my favorite action star, and now you know why. He’s done it all; the good and bad, action and comedy, he has an unmatched bodybuilding career, he is a bestselling author, and became the governor of California all before returning home to the silver screen where he belongs. This won’t be the last you’ll see of Arnold her at The Action Movie Time Machine. I’m Cory Carr and this concludes another trip in The Action Movie Time Machine. Until next time, I’LL BE BACK! For more from Cory, check out slaughterfilm.com. The home of weekly podcasts, reviewing the films that are legendary, even in Hell!